The best things to do in Costa Rica! Located between Panama and Nicaragua in Central America, Costa Rica is one of the most biodiverse nations in the world, making it full of incredible destinations, natural wonders and animal species to see. One vacation isn’t enough to see it all! In addition to pristine beaches and lush tropical rainforests, you’ll find national parks, volcanos, hot springs, cloud forests, botanical gardens, rivers and beautiful flora and fauna around every corner. Many people come to Costa Rica for its beautiful tropical beaches on both the Pacific and Caribbean Coasts. And for good reason! 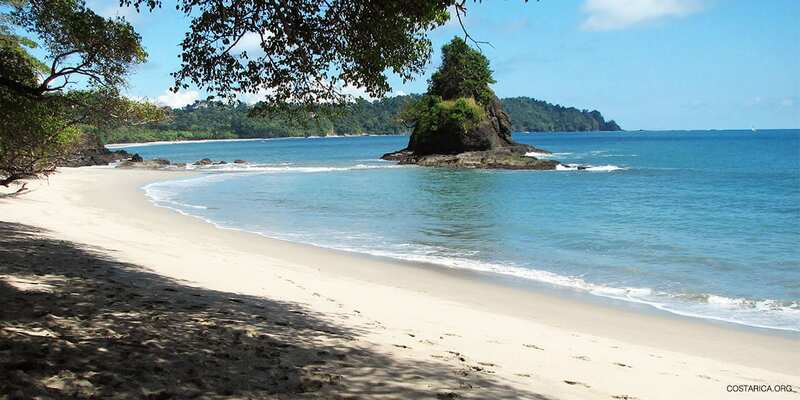 You’re sure to find beachside bliss on one of the many popular beaches (playas) of Costa Rica! Popular spots include Tamarindo, Manuel Antonio, Santa Teresa, Puerto Viejo – just to name a few of these Costa Rica attractions! Aside from beaches, Costa Rica is home to one of the most developed National Parks Systems in the world. There is an astonishing amount of the territory protected as either a national park, cloud forest, tropical rainforest, or reserve. Explore the rainforests, mangroves, wetlands that Costa Rica has preserved for all the world to appreciate and enjoy. And, if that weren’t enough – there are several volcanoes that are well worth the visit. Visitors flock from around the world to marvel at the Poas, Arenal and Rincon de la Vieja Volcanoes among others. Don’t miss the cities or villages either! Costa Rica boasts a very safe and clean atmosphere in their cities, towns, and villages. The best part about all the beautiful Costa Rica attractions is that they are all so close together! Want to see an active volcano, national park, tropical rainforest and volcano in one day? Visit La Fortuna! Or maybe you want to going hiking on hanging bridges or horseback riding through a cloud forest and spot several different bird species in Monteverde? The Monteverde Cloud Forest is perfect for you. Looking for turtles, howler monkeys, tropical flora and fauna and boat tours? Visit Tortuguero! Do you want to see scarlet macaws, crocodiles, a river and beautiful beaches? Go the the Jaco Costa Rica area and experience endless tours, the nearby Playa Hermosa and the lush Carara National Park. Thinking about scuba diving off the Caribbean coast, exploring a tropical rainforest in search of howler monkeys, sloths and iguanas? Cahuita National Park, located in the Caribbean region of Costa Rica, is perfect for you. If you want extreme hiking tours, visit Chirripo National Park for a two days of intense hiking in the southern area of Costa Rica. Does inshore sport fishing interest you? Visit Nicoya, located off the Pacific coast. From the Nicoya Peninsula you can also visit the San Lucas Island to see a historical prison that is now a tourist destination and national wildlife refuge. Visitors vacationing in Costa Rica can literally have it all! Whatever area, destination or attraction you decide to visit on your next Costa Rica vacation, you’re guaranteed to have an incredible trip! Visit the most amazing National Parks in Costa Rica. This little country is full of them and these parks are full of life. Such a diversity doesn’t exist anywhere else on earth. Volcanoes tend to stay the same for thousands of years but these ones are surprisingly alive Costa Rica holds some of the most active volcanoes worldwide. This little country might not have many islands but they are stunningly diverse and unique. These island are one of the best features of Costa Rica. There are rivers all over the country stemming from the mountains and down to the coast. You will have fun traversing the amazing rapids of even the deep canals of Costa Rica. In addition to cloud forests, beaches, and volcanos you can also make a trip out of lesser known cultural and natural attractions located in the Central Valley and all over the country. Many visitors to Costa Rica focus on the beautiful beaches and lush rainforests (and why wouldn’t they? ), but don’t overlook some spectacular museums, lakes, waterfalls and hot springs! For example, consider the National Theatre. Explore history and culture and unique architecture at the Costa Rica National Theater. On the inside you will see stunning paintings and statues–it’s almost like being in an art gallery that represents the entire country. Maybe stay in San Jose for a night and catch a concert or show! Another great attraction is Lake Arenal. Did you know that Lake Arenal is man made and is the largest lake in all Costa Rica. When you travel to the Arenal volcano you will see this amazing lake perfect for water sports! There are also a surprisingly large amount of historic site and ruins. Explore Las Ruinas (The Ruins) in Cartago. If you are looking for a bit more excitement, and maybe see a Costa Rica Soccer game, then it might be a good idea to visit the National Stadium. You might also see a concert, or even a few monster truck shows. We have lost count on how many waterfalls there are in Costa Rica but if you want to see some of the best ones why not check out the top ten here. The jungles of Costa Rica art fascinating and mysterious all at the same time. Look at the many different kinds of Rainforest there is here and see what one you will be near on your next trip to Costa Rica. Check out the best museums in the country from the national museum to the jade museum. They are full of history and fascinating artifacts. The Teatro Nacional is a cool place to visit because of its breathtaking performances. From stunning ballets to the orchestral compositions put on by the best of the best performers. If you are looking to have some fun while here in Costa Rica than check out the National Stadium. From the most exciting soccer games to concerts of the greatest artists. This is where the real history is. Experience the ruins of Costa Rica and find out what used to be here. These aren’t just old buildings but what used to be a way of life. The guayaba Monument is a really cool archeological site to explore when you visit Costa Rica. Find out more about this interesting site. This is the biggest man-made lake in all of the Central America. It is also one of the most beautiful in the world because of such a wonderful view the Arenal Volcano. If you want to indulge in the ultimate experience of relaxation than you should try out Costa Rica Hot Springs. For thousands of years, they have brought peace of mind to the body. If you like the excitement of Gambling then come play at any of the Costa Rica Casinos, see if you can win in paradise! Let us help you plan.